This site is by some great mobile developers who successfully combine education with the mobile lifestyle. Their understanding of the mobile lifestyle seems to surpass most other mLearning developers and I have a lot to learn from them. One thing I love is their use of anime type graphics and avatars. Good job Stephanie and Bryan! You've opened my eyes to a lifestyle angle I haven't really explored. 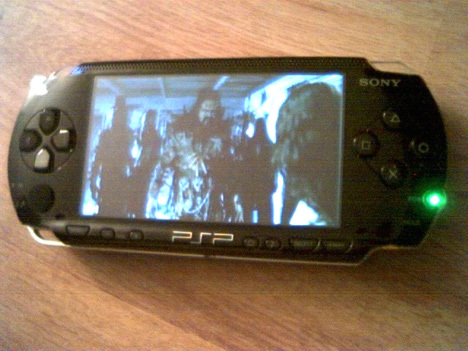 Sony PSP as Educational Handheld? To facilitate some fun inspiration for the new year, I broke down and bought a Sony PSP. I've never been much of a gamer, and only recently have I delved into Second Life, however, with more and more educational games being made for the Sony PSP, I've decided it's time to jump into the foray. While I know that this is only one mLearning platform, it is something that is popular among our next gen learners. We as education professionals need to stay one step ahead of our learners less we come to a point where we are unable to educate as their expectations have surpassed us. use it to educate pupils. Cornwall Hill College, in collaboration with the Meraka Institute of the CSIR, is developing research-based models and scenarios on how cellphones could be used to empower pupils and aid teachers. These models are being tested and evaluated in South Africa, Brazil, India, and Finland. This initiative, dubbed "MobilED", encourages teachers and pupils to use mobile devices in formal and informal learning situations. It is also hoped that the initiative will improve scientific and technical know-how by noting how young people use mobile devices in everyday knowledge-sharing and problem-solving situations in and out of the school environment. "Cellphones are seen to be disruptive and distracting instruments and detrimental to teaching and learning in formal teaching environments," said Cornwall Hill College spokesperson Britt van der Knaap. "An alternative way of looking at this is to embrace these widely used and owned instruments. "Even the most basic cellphones are powerful communication instruments and can be used to great advantage in the learning process to gain access to information as well as to manage, create and share content," she said. Using these microcomputers in formal learning environments can enhance and support existing learning strategies and benefit the advantaged as well as the disadvantaged pupil, Van der Knaap said. through values-based principles, instead of managing it on a rules-based system. Cornwall Hill College is now collaborating with Irene Middle School in developing and testing mobile supported learning to determine its impact in a resource-limited environment. Teachers form Cornwall Hill recently gave a presentation at the 5th World Conference on Mobile Learning held in Banff, Canada. from industry, to share their knowledge, experience and research in the various areas where mobile learning is applied. paper on the server platform created in using cellphones to access content in Wikipedia (an online encyclopaedia) via text-to-speech technology. Pupils of Cornwall Hill and Irene Middle School had the opportunity to address the issue of HIV/Aids among the youth and they could contribute their own perspectives to the growing body of knowledge by adding voice files to the existing Wikipedia. Cornwall Hill College teacher Adele Botha's presentation, "When Wikis grow up and go for outings", documents the experiences of her Grade 10 science pupils in creating their own online textbook in the classroom and accessing it via their cellphones during an outing to Gold Reef City. Fellow teacher Jacqueline Batchelor presented "Moving beyond a pilot", which focused on the implications of piloting and implementing mobile learning in a formal school environment and the catalyst for change brought about by the MobilED initiative. "It is encouraging to realise that South Africa and Cornwall Hill College in particular is on the cutting edge of developing and implementing mobile learning in formal learning scenarios," Van der Knaap said. EKL: Obviously IBM is really putting m-learning into practice. But where do you think the view that it’s been over-hyped has come from? CK: I think what happened, and thank goodness we fixed things, was that everyone in the marketplace was spinning out this term m-learning. And it’s cool, but people don’t buy m-learning. You can take advantage of its capabilities for a business application deployment for a sales force, field force, and so forth, but people don’t buy m-learning. It’s a capability. We gave it almost too much focus and drew attention to it, but pretty quickly we learned to back off and weave it through our existing offerings as a differentiator for us and a competitive advantage for the customers. We found that we need to get in the middle of these discussions with an important triad—the line of business (LOB) executive, the CIO, and then the CLO—and be the catalyst. The LOB exec is the person who is going to drive an m-learning deployment. Clearly no one would ever deploy a device just for learning. But the LOB executives certainly would because they’re trying to give a competitive advantage or be more efficient. I use the term enablement. The CLO can say, if you have connectivity out to our endpoints, think about what you can distribute in a profiled fashion. EKL: In 2000, you said we’re just on the cusp of achieving the potential of m-learning. Where are we now in 2005? To some people it may seem like not much progress had been made. CQ: If we’re still on the cusp, that’s more due to the economic downturn over the past few years than a fundamental flaw in the logic. To be fair, there’s been a steady increase in the infrastructure (greater penetration of phones, increase in networks, and so forth), that makes it a more attractive and practical proposition now. I actually think we’re now past the cusp and on our way. After being on the stump for mobile learning for the last couple of years, we’re beginning to see some action: initial contracts, some experiments, and so forth.